Eliminate drafts and transform your existing inefficient fireplace into an efficient heating source with Napoleon’s GDI-30 Direct Vent Gas Fireplace Insert. This gas insert has incredible, realistic dancing flames and elegant designer options to turn an ordinary drafty room into a warm and cozy setting. 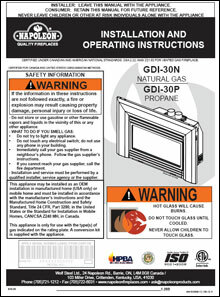 The Napoleon GDI30 is an exceptional gas insert that will provide you with years of warmth!